Blues guitarist Debbie Davies was in Albert Collins & The Icebreakers. After his death, she decided to go solo and has been recording and touring since 1993. You may have heard her recording of Scratches on the HBO series True Blood. She was born Aug. 22, 1952 in Los Angeles. Her father was an arranger for Ray Charles, Frank Sinatra and Pearl Bailey. Debbie was a big fan of British blues rockers like Eric Clapton and John Mayall. And Mayall turned out to be one of her biggest boosters. Debbie worked in San Francisco clubs for a few years. She moved back to Los Angeles in 1984 and Mayall hooked her up with his wife's band Maggie Mayall & The Cadillacs. In 1988, she joined Albert Collins & The Icebreakers and she remained there for three years. Then she joined Fingers Taylor & The Ladyfinger Revue. Taylor plays harmonica but I think it was an all girl band. They worked for Jimmy Buffett and opened all his early 90s shows. Debbie went solo in 1993 with Blind Pig Records. Collins appeared on her debut album Picture This. 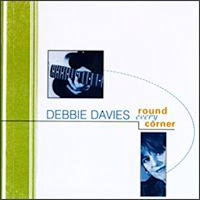 Scratches is from her 1998 album Round Every Corner which was on Shanachie Records. As I said, Scratches was used in the HBO series True Blood. The album was produced by Joe Ferry who is leader of Big Ska Band and producer of The Skatellites. Musicians include organist Jeremy Baum who works with Ferry, Bob Hoffnar of Indoor Life on pedal steel and Jonathan Sanborn on bass. I think he is David Sanborn's son. Debbie has won some WC Handy blues awards. She started her own label a few years ago and her latest CD was released in 2015. It looks like she is touring the festival circuit this summer. Here is Debbie Davies with Cassandra Faulconer on bass and Don Castagno on drums performing Scratches at Towne Crier Cafe in Pawling, NY Mar. 26, 2010.